Offer your patrons the refreshing simplicity of Bigelow Tea black iced tea. A delicate black tea, this iced tea is renowned for its slightly bitter flavor and relatively high caffeine content - approximately 30 to 60 milligrams per cup. The higher caffeine levels are also great for patrons who are looking for a mid-day energy boost. Give your customers the any-time refreshment they deserve with the freshness of Bigelow Tea black iced tea! This item has been certified Kosher by the KOF-K Kosher Supervision. "Great tasting and great value! Highly recommended this to any restaurant or big function! Easy to use and clean up was a breeze! Thanks webstaurant.com for offering high quality products!" Featuring a bold, full-bodied flavor profile, Bigelow Tea iced tea is the perfect refreshment for any occasion. Rich in home-grown flavors and natural antioxidants and low in sodium, fat, and calories, your health-conscious patrons are sure to enjoy guilt-free sipping on this delicious black iced tea. 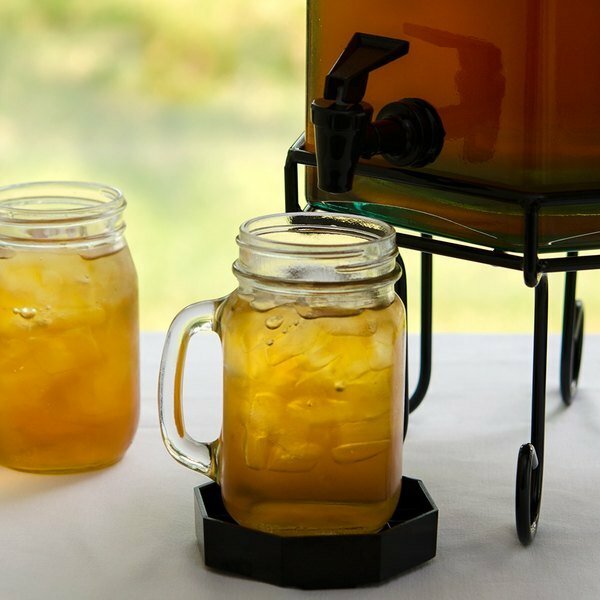 To make 3 gallons of this premium iced tea, just place one bag of tea into the basket of your iced tea brewer and brew according to the machine instructions. 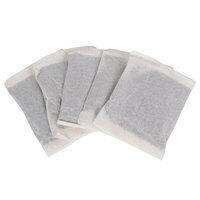 Do not use filter paper if you are using the tea bag. Pour the brewed tea over ice and serve. Take your presentation and flavor a step further by adding your own fruits and flavoring syrups to each ice-cold glass for a signature iced tea. A family-owned business since 1945, Bigelow takes pride in selecting only the finest ingredients to create artfully-crafted blends of tea. With 26 quality check points for each and every batch they produce, you can be sure that you're always getting the highest quality tea. Your restaurant, cafe, or hotel guests are sure to love a flavorful cup of black tea from a name they trust. The pre-measured Bigelow 3.5 oz. 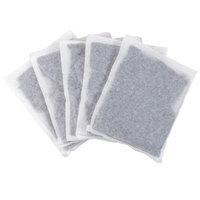 Black Iced Tea Bags - 32/Case are so convenient and very easy to use in our dispenser. Tea quality seems good, too. Very good black ice tea by Bigelow. This tea does have a little bit of a bitter taste, which this tea is supposed to have. It is a good bitter taste not a burnt tea bitter kind of taste. Excellent tea! We use this everyday, and brew multiple batches a day. We use it for regular tea and also add sugar to it for sweet tea. This tea was exactly what I was looking for. It has great flavor, and not bitter. I will certainly be purchasing again. Two thumbs up! Thank you for your review, Laura! We are sorry this Bigelow 3.5 oz. 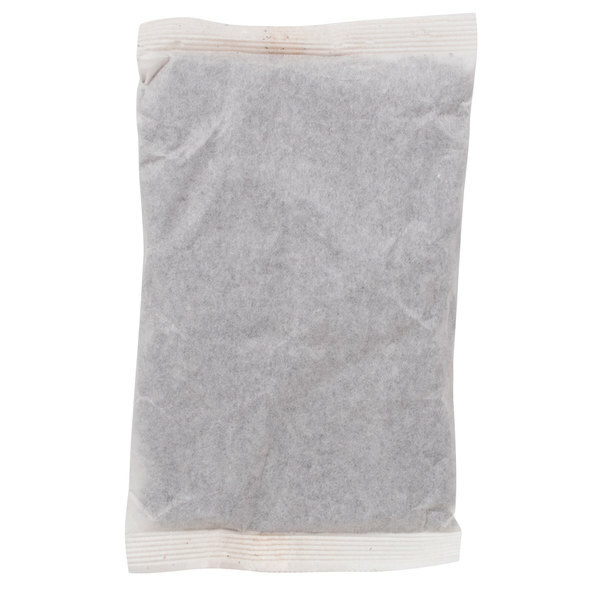 Black Iced Tea Bags - 32/Case has not worked well for you. A Customer Solutions Representative will contact you soon! These iced tea bags are really easy and convenient to use. They break pretty easily which cause confusion during a rush. We do like using them here and our guest enjoy the flavor. This Bigelow tea is as good as the national brands available from our grocery supplier, and come in at a fraction of the cost! 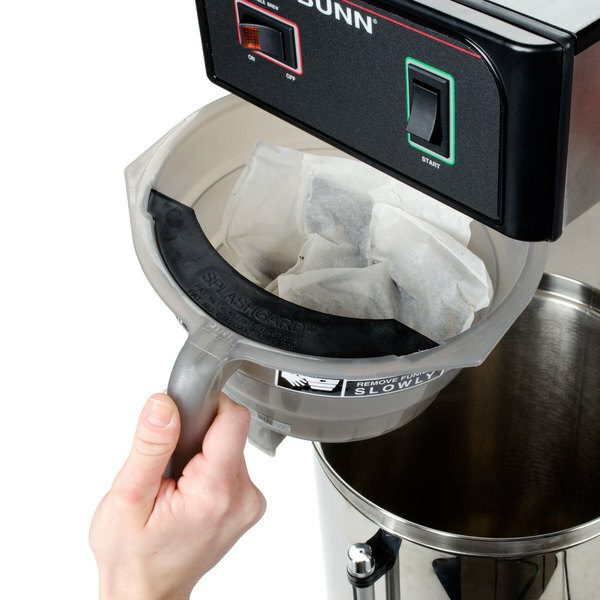 The proportioned bag is perfect for most restaurant tea brewers. 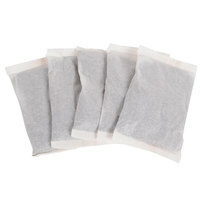 The tea was packaged in several bundles. I recommend storing the tea into an air tight container to keep it fresh if you are not using it right away. i plan on making home brew kombucha! Not bad for the price. Kinda weak flavor if you ask me.. But was a good add on for the price to add to my order!! An excellent quality tea. I have used other brands from local food and tea distributors but price savings adds up. Also, 3.5oz bags do the same job like 4oz Lipton or other. Love the black iced tea. It is bold and delicious and love the large size tea bags. Great for our bakery and awesome for infusing with other flavors. The Bigelow black iced tea is perfect. The large bags brew great in our commercial size brewer and is perfect for serving the whole family at gatherings. We serve this in our cafe and church regularly. Easy to brew. Easy to drink. Excellent feedback from customers and members alike. Mixes very well with flavorings for summertime iced tea blends! The Bigelow 3.5 oz. Black Iced Tea is a best seller at my establishment and I make am decent profit off it. It has a great taste and it is for a great price! Great product, very tasty! PLEASE Note that a single bag makes 5 gallons of iced tea (concentrated) otherwise it will look cloudy and taste too bitter. Fresh ice tea is a great way to save money you can sell it for the same price as other drinks but it cost a fraction of the price. People love this iced tea! They ask us where we get it and want to take it home with them! We are really pleased and will continue to order! Having this tea is nice for business, especially in the summer. Having just a tea that you can brew up and set out in container and dispense it when needed is nice. We use Bigelow Black Iced Tea in our cafe. This tea has a great flavor. We sell it sweet or unsweet and customers love it! Very good pour over tea, nice and fine for strong black tea. Its good for what we use it for. Good sized pouches for large amounts of tea. I like this tea. The flavor and strength are great. If you are sweetening it, just use sugar instead of making a simple syrup, which dilutes the tea. 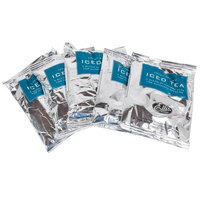 This product is a great value and makes great tasting tea. We've used it both in our tea brewer and stove top to make tea concentrate, ours guests love the flavor. Super lightning speed shipping and the tea is really really good, I do though use 2 coffee filters in conjunction with brewing the bag. It seems to have a better taste when I do this. What a great find! 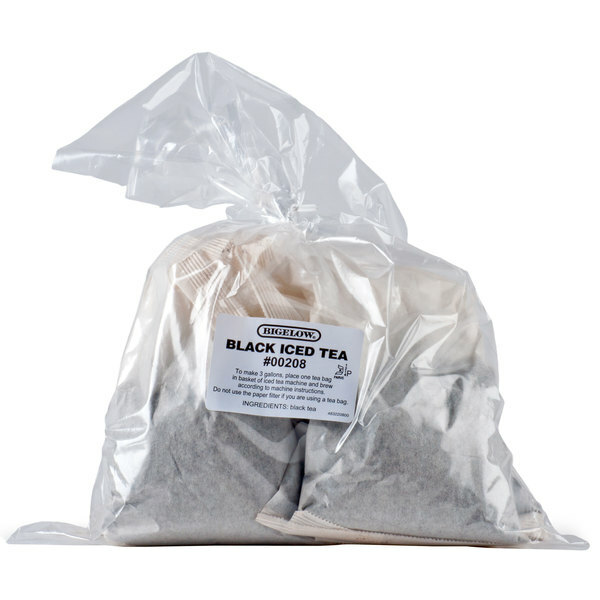 We brew a lot of iced tea, so it was great to find these 3 gallon bags. 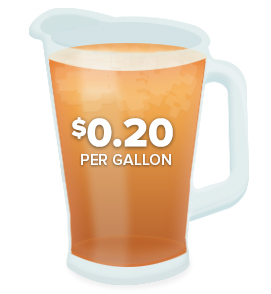 I like my tea strong, so we usually make about 2 gallons per bag, but they're still a great price! Great tasting and great value! Highly recommended this to any restaurant or big function! Easy to use and clean up was a breeze! Thanks webstaurant.com for offering high quality products! Very good products and very good price for any type of restaurant business ! I will purchase next time for sure ! I love webstaurant products! My husband loves this iced tea! He brews about 5 gallons at a time, so the larger bags make that much easier! Great taste, easy clean up, just what he wanted! This is a great low cost option for family meal! Employees enjoy it and its a simple way to keep your employees happy before service starts!! !